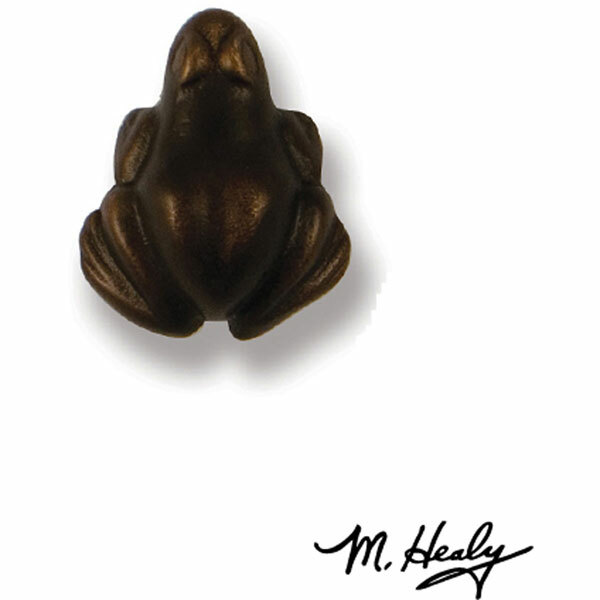 The Oiled Bronze Frog Doorbell Ringer was designed by Michael Healy, an accomplished Rhode Island artisan, known for his Unique Doorbell Ringers. Michael has many childhood memories of summer afternoons spent trying to catch frogs in his backyard. How happy he would have been to have found a frog such as this one hiding among the leaves. This playful Frog Doorbell Ringer is a reminder of the innocence of youth and will surely bring smiles to your guests' faces.The Oiled Bronze Frog Doorbell Ringer has been cast in solid brass. It was hand crafted in Rhode Island using the age-old art of foundry casting. During the process molten bronze was heated to over 2000° F then carefully poured into a hand-made sand mold. This mold was used only once, giving this Doorbell Ringer its individual character. The Frog Doorbell Ringer is then given a statuary oiled bronze finish, highlighted by hand and coated with a clear lacquer to protect its original finish. It has been signed by the artist, Michael Healy, to confirm its authenticity and quality craftsmanship.